The NH White Mountains offer spectacular scenery, and lodging year round. The White Mountain region is also a wonderful place to shop for art and photographs. There are several White Mountain art studios and galleries here including the fantastic art gallery in the mountain town of Bethlehem. Ask us about White Mountain NH Art Galleries or share your comments. To feature your NH Gallery or Art Studio, contact us. The Sandy Martin Gallery offers a dockside, Main Street, destination fine art gallery on Lake Winnipesaukee in Wolfeboro. Original oil paintings, watercolors, photographs, custom prints, and bronze sculputure depict the beauty of the Lakes Region by the artists who love it. 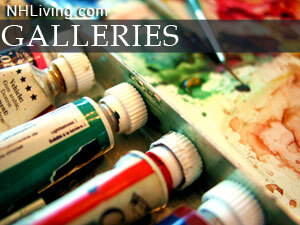 Discover NH Art Galleries and Artist’s Studios in every region. Great North Woods, White Mountains, Lakes Region, Dartmouth-Sunapee, Monadnock, Merrimack Valley and Seacoast.